The All India Football Federation (AIFF) and IMG-Reliance shocked many last month, when it was announced that the two new clubs which would be included in the Indian Super League (ISL) next season would be Bengaluru FC and the Tata-owned Jamshedpur-based side and that the two Kolkata clubs in East Bengal and Mohun Bagan would not get a place in the top league of Indian football. 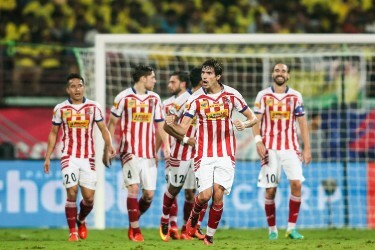 The two clubs have been trying their utmost to get themselves into the ISL, even threatening to stop the ISL from staging matches in Kolkata if the Mariners and the Red and Gold did not get a place in the star-studded league. This saga took an interesting turn yesterday when the State Secretary of the Bharatiya Janata Party (BJP) in West Bengal Ritesh Tiwari penned a letter to Prime Minister Narendra Modi. 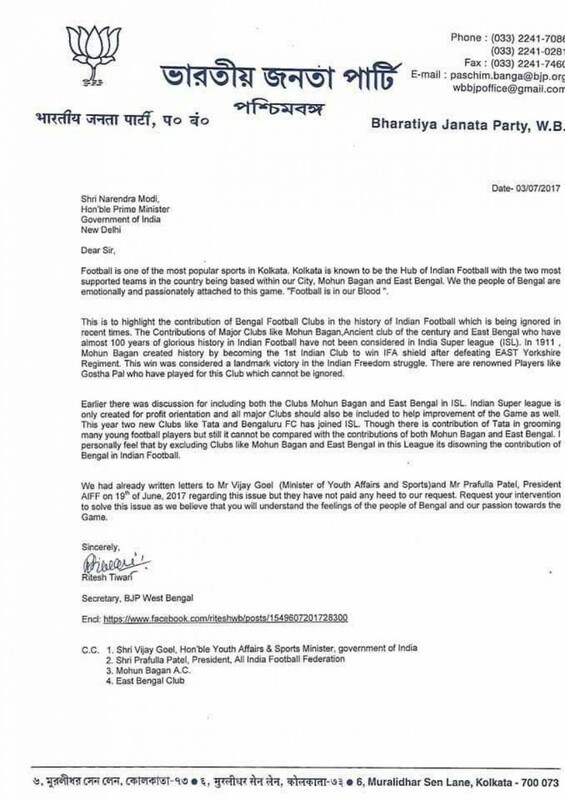 In the letter, Tiwari asked the Prime Minister to take steps in helping to include Mohun Bagan and East Bengal in the ISL next season. He wrote about how both clubs are the pioneers of Indian football and are too prestigious to be ignored from a competition like the ISL and pleaded with him to help get these two teams to play in the competition next season. 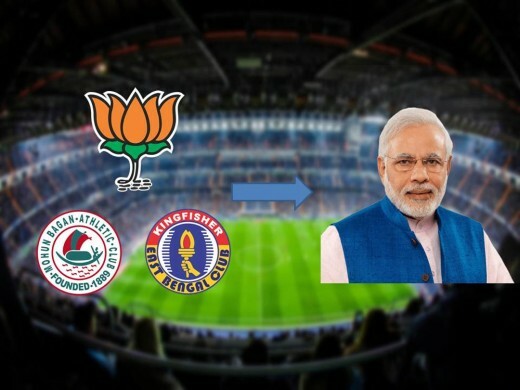 He further went on to thrash the ISL for being a "profit-oriented league" and stated that clubs like Bagan and East Bengal should be included to improve the state of football in India. Tiwari wrote about how he feels that it's disrespectful towards West Bengal that the two clubs are being "disowned" by the AIFF and how he feels that both Mohun Bagan and East Bengal deserve a place ahead of Bengaluru and the Tatas. Tiwari also wrote about how he'd penned letters to Vijay Goel, Minister Of Youth Affairs And Sports and AIFF President Praful Patel but did not get any response from either of them. He further signed off by requesting the Prime Minister to intervene and help to solve this issue as Tiwari feels that West Bengal's passion for football is being disrespected by excluding Mohun Bagan and East Bengal from the ISL.